Red Riding Hood tries to name all the trees in the forest as she walks the path to Grandmother's house. But the forest is so thick, she often has trouble telling the oak trees from the fir trees from the maple trees. They all run together into a fuzzy, green blur. How would the world look from space if the trees, fields, lakes, and mountains were each different colors? You could fly over looking for an orchard of your favorite apple trees, then swoop down and pick your fill! But there are other, maybe more important reasons for being able to see such details from space. For example, people who are doing jobs like . . . Helping control floods . . .
can do their jobs even better if they have very accurate images of the ground. Oddly enough, the best way to see lots of ground in lots of detail is from space! By sending our excellent technological "eyes" into space, we are able to understand and take better care of our home, planet Earth. Thanks to the Landsat satellites, we already have images from space of Earth's entire surface. In April 1999, the National Aeronautics and Space Administration launched the seventh Landsat. Each one gets better than the last, with more and more advanced technology for imaging and mapping our planet. To make future Earth images from space even better, a special spacecraft, called Earth Observing-1 (EO-1), was launched in October 2000. EO-1 is testing some very advanced new instruments. One, called the Hyperion, is very sensitive to tiny differences in colors. It is so sensitive that when its data are processed by computers, we can see clearly where one kind of tree ends and another begins! 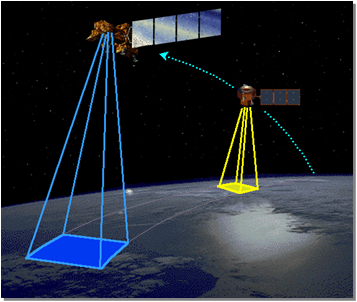 EO-1 flies right behind Landsat 7 and takes pictures of the same areas at almost the same times. This way, the images from the new EO-1 instruments can be compared with the images the current Landsat instruments give. This image was made from data collected by instruments on the current Landsat satellite. This is an image of that same area that can be made from data collected by EO-1's Hyperion. Besides sorting out trees, Landsat images show how the land changes over time. Cities growing, rain forests and farm lands shrinking, more or less rain falling, rivers flooding, wildfires burning, volcanos erupting—their effects show plainly in Landsat pictures of the same area taken at different times. 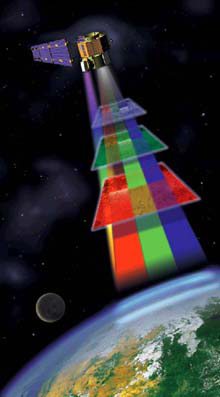 Artist's idea of Earth Observing 1 spacecraft taking images of Earth in many colors.